His book, The Path to A Future, describes how current industrial life is based upon structure of economy and politics that treat human life as a constant state of conflict and war à la Hobbes’ Leviathan. Such a wartime economy cannot prepare humankind for peace. As humankind enters its 41st Milennium, what it needs to prosper in the years ahead is not continuous preparation for war, but rather an acceptance of peace, and with that acceptance, a peacetime economy. The path toward that economy rests on three fundamental premises: peace, security and prosperity. These three ideas are axiomatic. 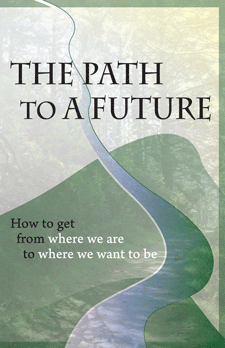 Everything along the path proposes to lead toward those three interdependent values. If one does not value them as goals, the path will prove meaningless. Mr. Percy argues forcefully, however, for the inherent value in these three ideas. He describes himself as “a citizen of the world, born in Malawi, raised in England and Scotland. Lived on three continents, travelled to more than 25 countries, started and run several businesses and raised two children.” Given that description, it surprises no reader that the view he takes on modern economic and political reality is eclectic. The basis of such a change, in the transition from wartime to peacetime economy hinges on three major frameworks: multilayer representation, variable law and freedom. Mr. Percy proposes simple and fundamental changes to the way we elect our representatives, support each other and develop economic prosperity, preserving the interests of the larger society (or, in a sense, the smaller society) and the individual’s freedom. Some are theoretical. Most are immediately practical, which is exactly the appeal of the book. The ideas in the book extend also onto Mr. Percy’s own website, Standards of LIFE, wherein the ideas in the book take on new and more elaborate directions. An EPUB version is available here.